Welcome to the live Columbia River camera showing traffic on the Interstate 5 bridge, between Oregon and Washington. The Columbia is the fourth-largest river in North America. NOTE: THIS WEBSITE HAS NOW MOVED TO Hayden-Island.com. Also check out our Earthquake Guide at Hayden-Island.NET. I hope you enjoy this site, although Hayden-Island.com is the new version of this site. The camera is currently off-line. It will show a live shot of Interstate 5 bridge when we get it going again. The camera can also be panned to show the Interstate railroad bridge, owned by Burlington Northern. It’s a mile west of the I-5 bridge. Completed in 1908, the railroad bridge was the first bridge to be built across the lower Columbia River. After the railroad crosses the Columbia, it continues south across Hayden Island to cross North Portland Harbor, historically known as the Oregon Slough. The Oregon Slough Railroad Bridge is also owned and operated by BNSF Railway. 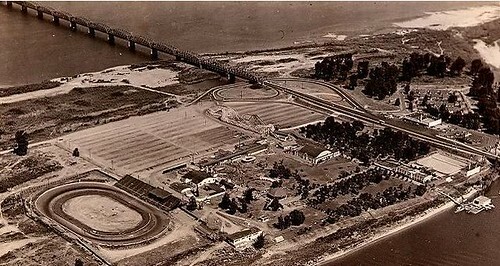 The Port of Vancouver and the Vancouver Grain terminal, which is owned by United Grain Corporation, is about 1 mile West of the I-5 bridge. NOTE: The camera is not (yet) operational. The live shot may be updated at the rate of 1 frame per second. The Oregonian has a time-lapse made from the wheelhouse of a working tug traveling through the I-5 bridge. Realtime Marine Traffic Maps show vessel position while PlaneFinder.net maps realtime flights from PDX. Vancouver Washington is located at River Mile 128 on the Columbia River, near the confluence of the Willamette River which goes through Portland, about 12 miles south from this point. Bridges across the Columbia River include the Lewis and Clark bridge, about 50 miles west, connecting Rainier, Oregon to Longview Washington. The Astoria Megler Bridge is at the mouth of the Columbia River. The Bridge of the Gods, some 40 miles upriver, connects Cascade Locks OR to Stevenson, WA. The Bonneville Power Administration sells electricity from 31 dams in the Columbia River Basin, including its namesake dam near Cascade Locks. Hayden Island, where this camera is located, is just North of Terminal 6, with the Columbia River flowing on both sides. Here’s a walking tour though West Hayden Island. The Port of Portland’s Marine Terminal 6 lies immediately south of Hayden Island. 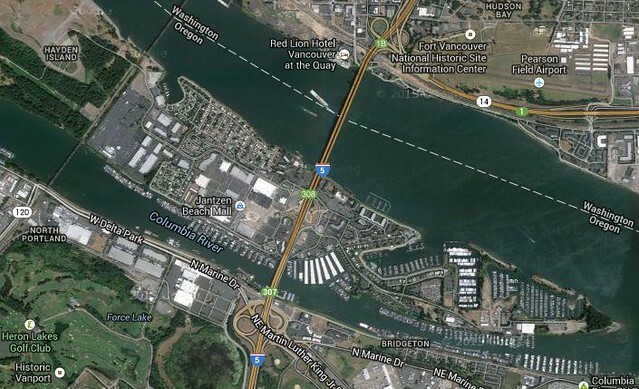 Kelly Point Park, the point of confluence between the Columbia and Willamette Rivers, is off to the left of Terminal 6. 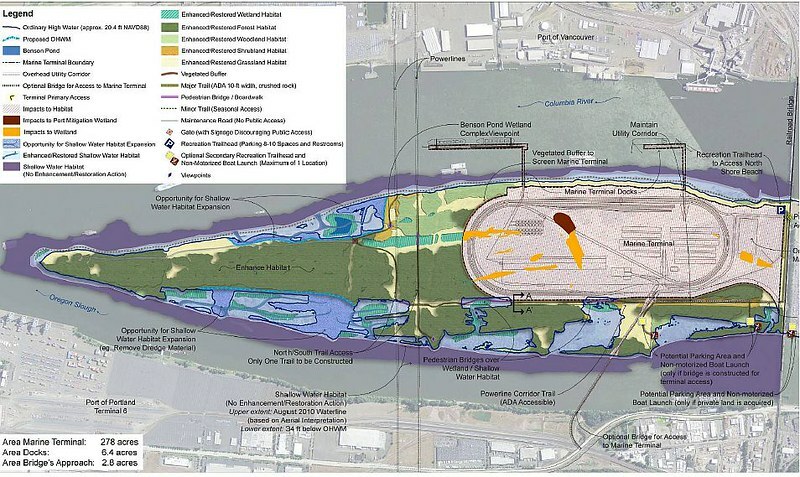 In July, 2013, the city’s Planning and Sustainability Commission voted to support annexation of the Island to the City of Portland to enable the Port to create a deep water marine terminal on some 300 acres, but that support carried a variety of mitigation requirements for the Port. 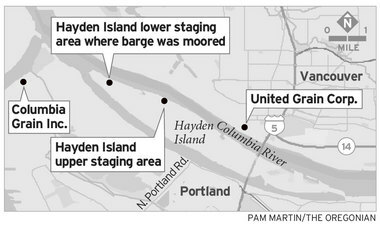 On Jan 8, 2014, Port of Portland officials said that they would NOT proceed with developing marine terminals on West Hayden Island. The Port blamed the city for requirements that would price the land out of the market. MyHaydenIsland.com (Hayden Island Neighborhood Network) – Non-profit with representatives from the 16 different housing groups on Hayden Island. Hayden Island Livability Project – Non-Profit organization protecting, investing and renewing the livability of Hayden Island. The Port of Longview generated revenue of $28 million in 2011, the Port of Vancouver, with more than 50 marine and industrial tenants, employ 2,300 people, generating a total overall income of $859.6 million, while the Port of Portland aviation and marine activities produced more than $1.7 billion in total income for the region. In contrast, the Port of Astoria is losing money. Until recently, Vancouver’s United Grain and Portland’s Columbia Grain on Terminal 5 received grain only via rail. But now, Tidewater and Shaver tugs deliver barges to two staging areas on the North side of Hayden Island where they are then retrieved by grain-elevator companies. The grain operators dispute with longshoreman is ongoing.